Fix the BAD_SYSTEM_CONFIG_INFO error resulting in BSOD on Windows 10 by following instructions we provided here. 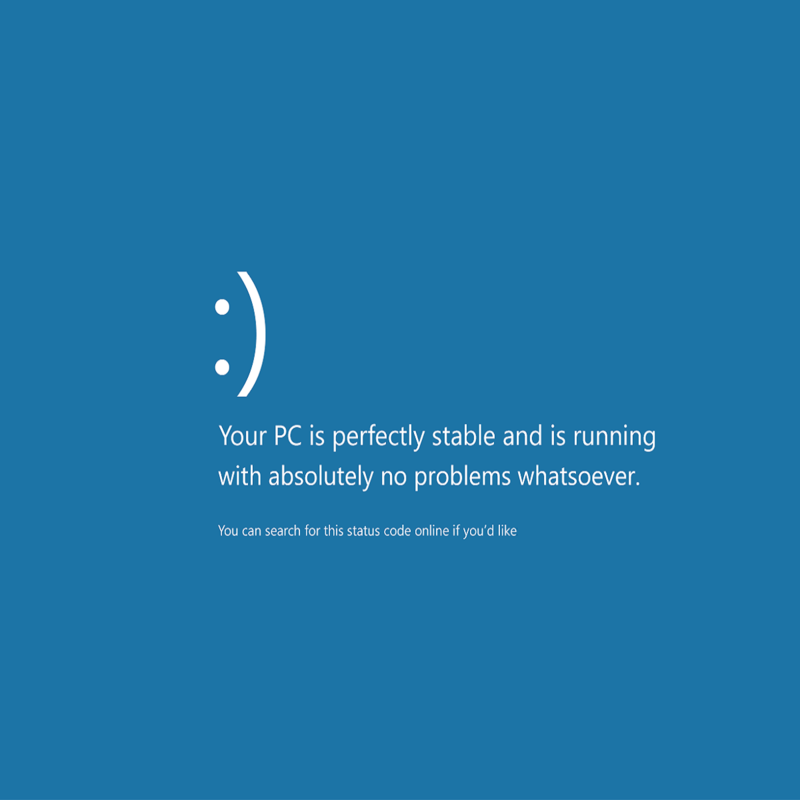 Blue Screen of Death errors, also known as STOP errors, are one of more serious problems on Windows 10. These errors can be caused by incorrect system settings, software, or even by a faulty hardware. Since these errors can so problematic, today we’re going to show you how to fix BAD_SYSTEM_CONFIG_INFO BSoD error. Bad_system_config_info registry – According to users, sometimes this error can occur due to problems with your registry. Several users reported that registry corruption was the main cause for this error. Bad_system_config_info RAM – Your hardware can also cause this problem to occur. According to the users, the most common cause for this problem is faulty RAM. Bad system config info on startup, boot – According to users, this error often appears as soon as your PC boots. This can be a big problem since your PC will restart as soon as this error appears. Blue screen of death bad_system_config_info – Many users reported this Blue Screen of Death error on their PC. In most cases this error is caused by faulty hardware or a bad driver. Bad_system_config_info after update – Several users reported this error message after installing an important update. If that’s the case, you can fix this problem simply by removing the problematic update. Bad_system_config_info hard drive, HDD – Hardware failure can often cause this problem to appear. According to users, this error usually appears if your hard drive is faulty. Bad system config info loop – In some cases your PC might end up in a reboot loop due to this error. Several users reported that their PC can’t boot at all because of this error. Bad_system_config_info ntoskrnl.exe, ntfs.sys, classpnp.sys, rdyboost.sys – This error message will often inform you which file caused the error to occur. Once you know the file name, you should be able to find the application or device that is causing this error. Outdated or incompatible drivers can cause many issues. For example, if your drivers don’t work, you won’t be able to use certain hardware, and in worst case scenario, you’ll get a BSoD error such as BAD_SYSTEM_CONFIG_INFO. Since many Blue Screen of Death errors are commonly caused by drivers, we strongly advise you to update your drivers as often as you can. In order to avoid all BSoD errors, be sure that all major components are up to date with latest drivers. Downloading drivers is fairly simple, and all you need to do is to visit your hardware manufacturer’s website, locate your device and download the latest drivers for it. After installing the latest drivers, BSoD errors should be resolved. Bear in mind that you’ll have to update as many drivers as you can in order to successfully fix this problem. In order to fix BAD_SYSTEM_CONFIG_INFO and many other BSoD errors, it’s important that you update all drivers on your PC. This can be a long process, especially if you do it manually, download TweakBit’s Driver Updater Tool (100% safe and tested by us) to do it automatically. This tool is approved by Microsoft and Norton Antivirus. After several tests, our team concluded that this is the best automatized solution in order to prevent permanent damage to your system by downloading and installing the wrong driver versions. BAD_SYSTEM_CONFIG_INFO error can often appear if your system configuration isn’t correct. If your system isn’t properly configured, and the number of processors and amount of memory in the configuration file doesn’t match the correct value, that will cause BAD_SYSTEM_CONFIG_INFO error. Restart your computer while it boots. Repeat this step until you start Automatic Repair. Close Command Prompt and try starting Windows 10 again. If for some reason your BCD file gets corrupted or damaged, that can cause BAD_SYSTEM_CONFIG_INFO error, and you won’t be able to access Windows 10 or Safe Mode at all. Insert the bootable DVD or USB flash drive and boot your PC from it. Windows 10 setup will start. Click Next and then click on Repair your computer. It’s worth mentioning that the last command will delete Master Boot Records and recreate them, so be careful while using it. After you’re done, close Command Prompt and restart your PC. Boot your computer from Windows 10 installation media. For more details on how to do that check the previous solution. By entering these commands you’ll rename all these folders. After you rename them, Windows 10 won’t be able to use them anymore. You can also delete them, but it’s always better to rename them in case you need to restore them later. This will copy the registry backup and replace the old files. Close Command Prompt and restart your computer. Restart your computer couple of times while it boots. This will start Automatic Repair process. Select Troubleshoot > Advanced Options > System Restore. Select your username and follow the instructions. 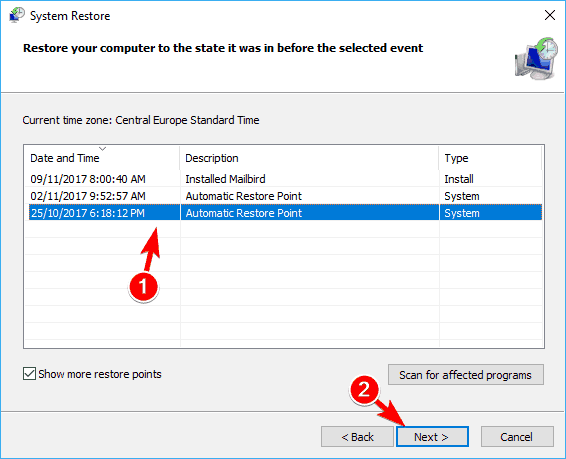 Select the restore point you wish to restore to and click Next. Wait for the System Restore process to finish. 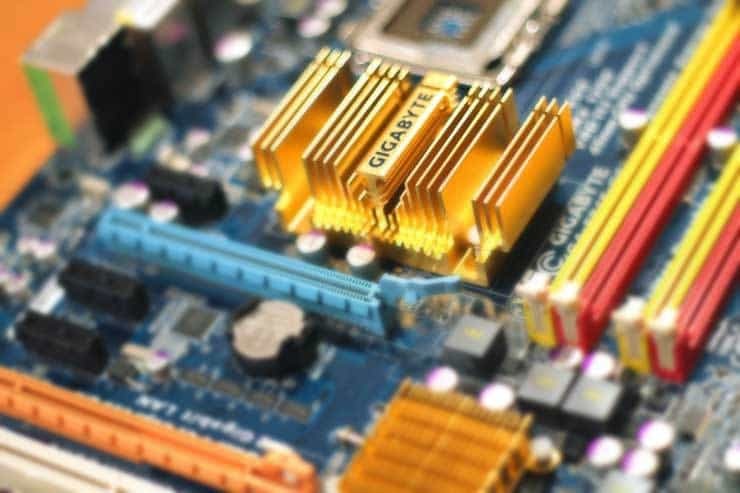 Start Automatic Repair process by restarting your computer few times. Select Remove everything > Only the drive where Windows is installed > Just remove my files. In order to complete the Windows 10 reset, you might need Windows 10 installation media, so be sure to have one. After the reset process is completed, you’ll have fresh installation of Windows 10. If the BSoD error was caused by a software, it should be fixed after the reset, but if the BSoD error appears again, it means that you have a hardware issue. Most commonly the BSoD errors are caused by faulty RAM, so be sure to check your RAM first. 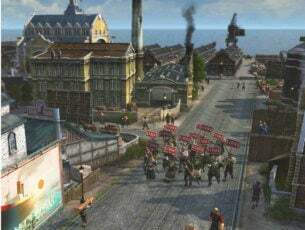 Users reported that BAD_SYSTEM_CONFIG_INFO error can also be caused by a faulty hard drive, and according to users, replacing the hard drive fixed the problem. It’s worth mentioning that almost any component can cause this error, so be sure to perform a detailed hardware inspection. If you’re still having issues with your hardware after a close inspection, we strongly recommend you to download this tool (100% safe and tested by us) to fix various PC problems, such as hardware failure, but also file loss and malware. BAD_SYSTEM_CONFIG_INFO isn’t serious as other BSoD errors, and it can be easily fixed. Users reported that this error was fixed by using bcdedit or by fixing Windows Registry, so be sure to try those solutions.